Your tax-deductible gift means the world to our rescues, no matter the size! Donate, sponsor a rescue, visit our Amazon Wish List – whatever you choose, your contribution will make a huge difference. Scroll down to see our membership packages, too. We think they make great gifts! Click Cinder for a general donation in our online store. You can always mail us a check or money order, too! Your yearly gift entitles you to a free subscription to our newsletter, The Howling Reporter, and your choice of our exclusive wolfy items! Memberships make a great gift for any occasion. We’ll be happy to personalize a membership, too! Newsletter and our member magnet. Newsletter, greeting card, and member magnet. Newsletter, $20 OFF one Member T-shirt, and member magnet. Newsletter, $20 OFF one Member T-shirt, personalized certificate and rescue magnet. Click to donate through PayPal. You can also call us to donate. Thank you! Enrichment is vital to the overall health of any captive animals. Our rescues get enrichment each day, but four times a year they receive a seasonal, exciting surprise full of interesting smells, textures, and treats. Your $35 gift supports the fun! SPRING ~ A natural basket full of treats. SUMMER ~ Meat and treat-stuffed watermelon. FALL ~ Meat and treat-stuffed pumpkins. WINTER ~ A wrapped present full of treats. LIKE TO KNOW EXACTLY WHERE YOUR DONATION GOES? Make our wishes come true by shopping from our Wish List. Sign up at AmazonSmile, choose Wild Spirit Wolf Sanctuary as your charity, and Amazon donates a percentage to us, no matter what you buy. Don’t have money to give? Your time is valuable, too! Check out all the ways you can help Wild Spirit by volunteering. We can always use passionate people, quick minds, and hard-working hands! 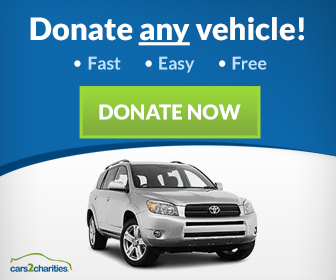 When you donate your car through Cars2Charities, we take care of all the paperwork and help you avoid possible issues that could arise in donating a car … so that you can simply enjoy the feeling of happiness you experience when you donate a car to charity. Knowing that those who donate cars are making a significant contribution to the causes they care about is a major motivator for others who want to do good in a similar way.